Hi Lou! I love reading what you write: there’s always so much in-depth understanding and wisdom to what you say. This wisdom about the wolves serving to re-wild the deer herd and the cattle — and the guard dogs and coyotes — is a good paradigm for what I’ve been seeing in a slice of the coyote world: Life became too easy for one coyote: to see her frolicking on a hill totally carefree, every day, within mere feet of people and dogs made me feel that she’d been robbed of her essence — she seemed more pet than wild animal. I did my best to keep people from being friendly or feeding her, but her wary/wildness seemed to be something she no longer had: there was no need for it. And then one day another coyote came into the area with a territorial agenda of her own, driving our coyote out. Because of this, our displaced coyote appears to have been re-wilded in the sense you speak about, having to look over her shoulder for danger and use her wits to survive. She is more careful, more wary, less out-in-the-open, more, as you say, wild and natural. It’s a good way of looking at the situation here, based on what you’ve said about the presence of wolves and their effect on “re-wilding”. Thank you for your insights! This is Lou. We’ve had some interesting times on some of the ranches bordering BLM lands and the canine dynamics are in change I think. Our area has been verified by locals and biologists as having a [new] resident pack of wolves. They have not bothered livestock to anyone’s knowledge with predation, but there are definite changes noted. Elk which used to gather rather lazily out in open are now very alert and quick moving. Fuzz the ranch dog has given up roaming at night. He stays closer, and has ceased long distance ranging as well. This is most unusual for him. Also, the LGD are much more vocal at night and at times seem quite agitated as the evenings come. The biggest change we’ve seen is among the coyote on the coyote friendly ranch. They too, have seemed to change. They are very vocal and act unsettled though no hunting or skirmishes with dogs has happened. Both LGD dogs and coyotes seem to avoid one area of ranch which connects to Cascade forests. One thing for sure-no one seems to pay much attention to coyote when wolves are known to be in area. The old gentleman on the ranch is touching. He’s worried about his sheep, his dogs, “and the local coyote.” He says “I hope they keep far from that pack” I assured him his coyote would be pretty careful around wolves. Packs of territorial wolves are known not to tolerate coyote or dogs in their woods. All the same-the canine conversation and dynamics will continue. I feel dogs, coyotes and wolves can exist-with caution-and coexist well. Hi Janet! In essence, once wolves become established as a pack, they are the “top dog” in woods, with exception of a pack of experienced LGD. Yes, I’ve seen films of wolves on coyote. No mercy there from the wolves. 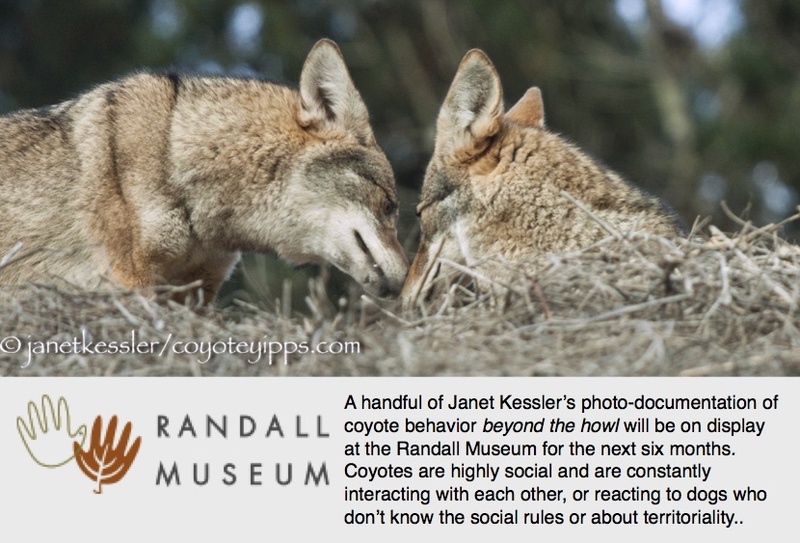 I don’t know what the effects ultimately will be but I know [the coyotes] will survive. The rancher who enjoys them is pretty upset with wolves being here. He says he doesn’t expect wolves to wipe out his cattle. But he feels “coyotes are easy to live with, are smarter and adapt to living with people.” Regarding wolves he says “They are hard to live with. They are harder on the land. They scatter the elk and make them skittish. They cost cattlemen money not because of lots of predation but because of lost weight. Cattle get spooked by wolves in area and move alot more. Eat less and are much more alert. They don’t gain as much weight for summer, which means herd wise thousands of pounds less for Fall sales, and that’s financial disaster. Coyotes eat mice and grasshoppers literally sometimes under cattle. A wolf moving through cattle, or a pack, will cause fear. And finally the guard dogs are respected and feared by coyote. A wolf pack only respects another pack and then only if its very powerful”. He seemed without anger or prejudice with these words. But felt very strongly Coyotes are good neighbors and small ranged, whereas wolves are alot harder to predict and gave huge ranges. I do feel he’s quite upset by the great change he feels have taken place with “his” coyote. He says numbers have dropped, and that denning areas have been abandoned on the wooded side of his ranches and that the pack that lived there has disappeared. He also feels his dog Fuzz is terrified of the wolves and this is why he’s staying close to home. I think the coyote are going to be viewed as almost harmless by ranchers compared to wolves. So the coyote may well recieve less attention from human hunters, as he gets new attention from the new canine neighbors. Or old predator returned. Hi Janet! The cattle weight loss is very revealing, because it hits the truth about the situation. Rightfully so, ranchers are concerned about financial affects. A herd of fat, relaxed cattle vs a herd of leaner, fit cattle means alot of money lost. Also, with hunters, I know what upsets them. Elk here haven’t seen wolves almost 100 years. They tend to be relaxed and congregate in large groups that move and feed slowly. Hunters like this. The elk are predictable, easy to find and hunt to a degree. When wolves arrive, they do not wipe elk out. But the effect on elk is electric. They become skittish and scatter into the landscape. They become alert and elusive and move often. The wolves take many young, old, unfit or those who make mistakes. Literally, wolves make deer and elk very wild. They cause game animals to reconnect to instincts of evasive living. Hunters don’t like that. A morning hunt can no longer be so easily scheduled, and may turn into days of effort that some may not have time for. So wolves cause an effect in the land and animals. And some do not want that. Wolves make wild things wild, instead of an extension of farming. I know some wolves will be poached. But they are colonizing all over and really can’t be stopped now. The wise and wary wolves will stay in wilderness and stick to deer and elk. The too bold or inexperienced may visit ranches or unsuitable places-and may pay for it. But I feel wolves are here to stay. Plus for now they are federally protected. Previous Adversity Continues Next Hello Stranger! Fascinating! THANK YOU!!! I recently went wolf tracking in very snowy and remote the Northwoods of Wisconsin. I loves wolves and coyotes. I like having Wolves returning. It balances nature which is good overall. Agreed. They belong here and fill a niche. And we can and should learn to live with them. We don’t have the right to wipe them out simply to make life easier and more convenient for our own gains.